Joseph the bellmaker is worried because he has not heard from his daughter Mariel in four seasons. Mariel is a restless, bold little mouse who needs to be off and doing and she left Redwall, with her best friend Dandin for company, to seek. Then one night Joseph is visited by Martin the Warrior in his dreams. From Martin?s words Joseph understands that Mariel is in trouble and needs his help. In short order Joseph is off with four others; Foremole, Rosie Woodsorrel the hare, and Rufe Brush the squirrel, Durry Quill the hedgehog. Mariel is indeed in trouble. She and Dandin have gone to the aid of a group of creatures who are trying to overthrow the cruel and heartless fox Urgan Nagru. With his bloodthirsty mate Silkvamond and their rat hordes, Urgan has taken over Castle Floret and has imprisoned its former owners Gael Squirrelking and Queen Serena. Outside the walls of the castle the good creatures of Southsward scheme and plan, trying to find ways to free the prisoners and remove the foxes and their rat soldiers. Slowly but surely the creatures from Redwall and those of the Southsward come together to form a force, brave and true, which might have a chance at defeating the terrible Urgan Nagru. 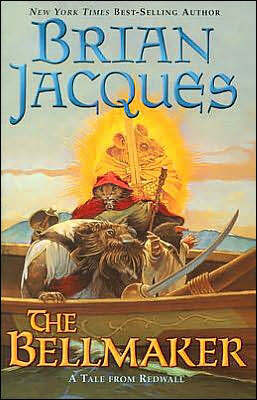 The seventh book in the Redwall series, this story is full of the adventure, the riddles, and the rich characters that Redwall fans have come to expect from Brian Jacques. Those who have read "Mariel of Redwall" will enjoy finding out what that brave little mousemaid did next.